The Cassini spacecraft has revealed sand dunes on the surface of Titan, Saturn’s giant moon. The dunes look very similar to those seen in the Namibian desert. They appear to have been sculpted in much the same way as dunes on Earth, even though conditions on Titan are very different. Radar images of the surface of Titan taken by the Cassini spacecraft last October have revealed parallel lines of sand dunes 100 m high and stretching for 1,500 km—comparable to those in the Arabian and Namibian deserts on Earth. Until now, scientists had thought these dark equatorial regions of the moon to be oceans of liquid hydrocarbons that would trap sand. 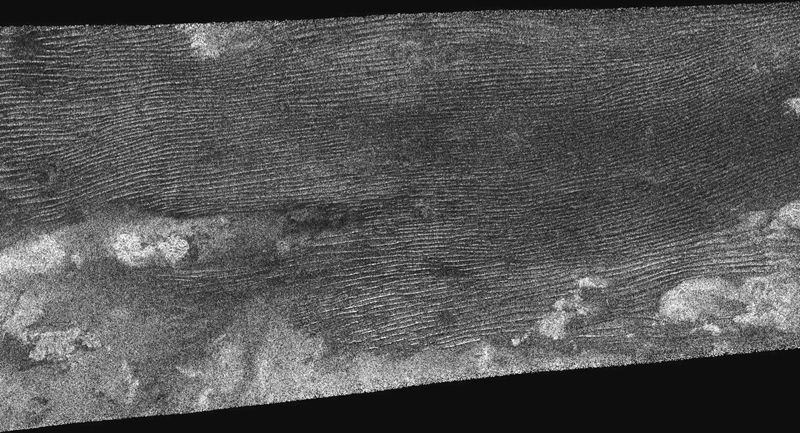 The presence of sand dunes on Titan is indeed surprising, as the physical process that has formed them seems quite similar to what we see on Earth, despite the very different environmental conditions. 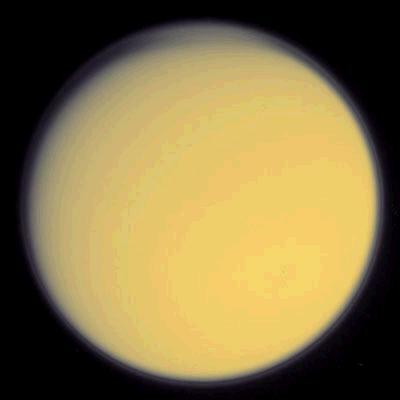 Titan’s atmosphere is thicker than Earth’s, its gravity is weaker, winds are light (less than 2 kph) and the sand’s composition—a mixture of organic materials and ice grains—is unlike the silicates we are familiar with. The pattern of these dunes at the equator, running in long straight lines, is characteristic of features formed by winds blowing in different directions. This is most likely due largely to tidal forces exerted by Saturn on its nearby satellite, 400 times greater than lunar tides on Earth. Scientists think they now have a clear understanding of the dune formation process on Titan, but they are still unsure where the sand came from. Gullies and canyons observed by the Huygens probe during its descent through Titan’s atmosphere in January 2005 seem to indicate that powerful erosion mechanisms are at work on the moon’s surface. The sand could have been formed by violent storms and intense methane rain.